A feed-in tariff (FIT) is a policy designed to promote the renewable energy resources. A feed-in tariff amounts to a guaranteed payment to homeowners (and other energy developers) for the electricity they produce. Feed-in tariff payments are for a preset amount. Generally FIT payments are made over a period of 15 to 20 years. FIT programs have been very effective around the world, a lot of FIT programs are currently in place throughout Europe and have been especially successful in countries like Germany. There are presently six U.S. states (California, Hawaii, Maine, Oregon, Vermont, and Washington) that have legislated FITs or comparable programs. A few other states also have utilities with voluntary FITs. There is growing interest in FIT programs in the United States, especially as evidence mounts about their success as programs that promote renewable energy and economic development through new job creation. In the case of a home solar power system, people are often confused by the similarities between feed-in tariffs and net metering. Net metering means a homeowner with a photovoltaic home solar system would have one electricity meter on their home. Electrical power produced their solar panels is measured in both directions; what is used by the homeowner and the excess that is put back into the grid. Depending on the net metering agreement the homeowner then benefits from the excess energy produced by the home solar system. 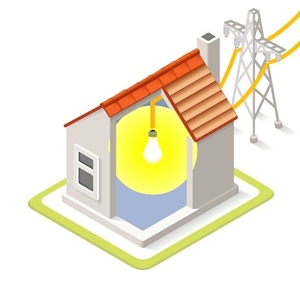 Net metering reimbursement is usually directly tied to the current retail kWh rates of the utility grid it is connected into. Feed-in tariffs differ in that there is a purchase agreement by the utility company to buy all power introduced into the grid by the power producer. A home solar system would have two separate electricity meters; one to measure power into the grid and one to measure energy usage by the property. The owner is then billed at the retail kWh rate for power used and paid by the utility company for power put into the grid. This enables the possibility for different rates for production vs. usage. Many states, local governments and municipalities have mandated renewable energy goals called Renewable Portfolio Standards. Renewable Portfolio Standards set a specified amount of energy produced by a utility that must come from renewable resources. If a utility company does not meet these standards they face the possibility of receiving heavy fines. Feed-in tariffs allow utilities to provide an alternative to net metering. The advantage for a homeowner in some areas is that a feed-in tariff can exceed the retail kWh rate, the utility company ends up paying you every year. An extreme example of a feed-in tariff success would be the response in Japan to the Fukushima nuclear power disaster. Japan’s government introduced a feed-in tariff for green energy, to replace the lost nuclear power, that approximately doubled the retail kWh rate. That offer resulted in approx. 1.2 million applications mostly for solar power. 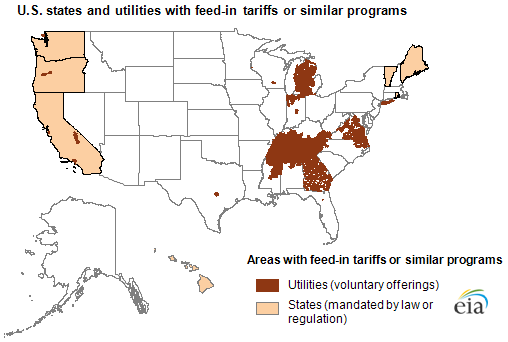 Feed-in tariffs are still relatively new in the United States and not available everywhere. Our Solar Consultants tell you if feed-in tariffs are available to you and if a FIT is the best option to get you huge savings on your electricity bill by switching to home solar power.